In setting the film in Hollywood itself and that too in 1927, when the advent of sound into cinema with the success of The Jazz Singer would sound the death knell for silent films, The Artist (which is actually French-produced) both echoes and pays homage to Singin’ in the Rain (1952), the classic musical that took a comical look at the period of upheaval that followed this event. 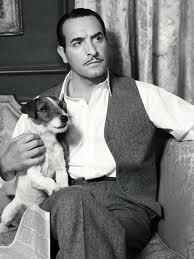 So it is surely divine coincidence that The Artist’s lead actor Jean Dujardin bears a striking resemblance to that film’s co-director and star, Gene Kelly. And like Kelly’s character, Don Lockwood, Dujardin’s cinematic alter-ego, George Valentin, is also a matinee idol of the silent screen in the Douglas Fairbanks mould, whose inability to deal with the demands of the suddenly transformed medium lead to disaster. But where Singin’ dealt with its subject with straight up humour, The Artist does so with old-fashioned pathos, pulling us into Valentin’s downward spiral, as he loses his money, career, friends and self-esteem. But cinematic darkness always has a counterpoint, and here it takes the form of effervescent starlet-turned-star Peppy Miller (Bejo), who has carried a torch for the fallen idol ever since a brief encounter between the two in his heyday. Can Peppy’s love bring Valentin back from the brink? And even if it can, is it enough to redeem him in his own eyes? The beauty of The Artist’s story, simple though it is, lies in its telling; because there is no dialogue to listen to or, dare I say, be distracted by, we are free to marvel at the visuals which are nothing if not sheer enchantment. The director’s decision to shoot the film in the 1.33:1 ‘Academy ratio’ just as in silent-film days, is beautifully complemented by the velvety black &whites of Guillaume Schiffman’s stunning cinematography. But of course there is much more to it than just pretty pictures; Hazanavicius creates moments of pure poetry on film with a series of masterfully written and acted sequences that take us into the thick of a time and place long forgotten, accompanied by Ludovic Bource’s enthralling background score. The narrative structure also allows us to become completely absorbed with the main characters who, as essayed by the devastatingly charming Dujardin, and the equally splendid Bejo, are so very much of their time and yet somehow also utterly timeless. Needless to say, The Artist’s old-world appeal will not be to everyone’s jaded taste, but for many of us, the answer to the question ‘But can a silent film really work in this day and age?’ is, in a word, oui! Cult: Silent Movie (1976) – Mel Brooks’ audacious little comedy featured a cameo by legendary mime Marcel Marceau, who also uttered the only word spoken in the entire film. Current: Hugo – Martin Scorsese’s lyrical love letter to the magic of the movies is one of 2011’s best. Coming Attraction: Alfred Hitchcock & the Making of Psycho (2013) – Sir Anthony Hopkins will star as the Master of Suspense in Sacha Gervasi’s chronicling of the production of the first modern slasher flick.